The original Hawkeye apple held up to cooking better than its modern-day descendant, but if you cannot get Hawkeyes in your area, many other heirloom apples work well. Visit your local orchard to see what they have. This stuffing is delicious on its own, or can be stuffed into a pork chop topped with caramelized onions for a great seasonal entrée. Melt the butter in a large sauté pan over medium-high heat. Sauté the apples, pecans, onion, and celery in the sauté pan until just tender. Add the sage, salt, and pepper. Add the bread and mix thoroughly. Add the stock, a little at a time, until it is absorbed and the stuffing reaches the desired consistency (all a matter of taste, really; you may need more or less stock). Cool to use as an actual stuffing, or put in a shallow buttered casserole and bake about 30 minutes at 350 degrees until crisp and crusty on top to serve as a side dish. 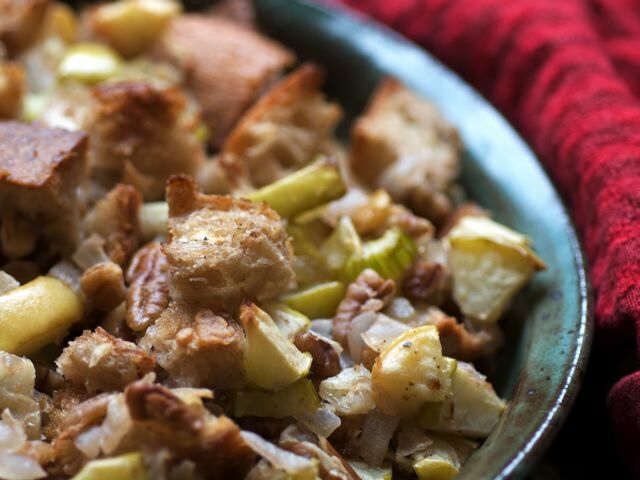 Makes enough to stuff a 12- to 15-pound turkey or serve 6 to 8 as a side dish.